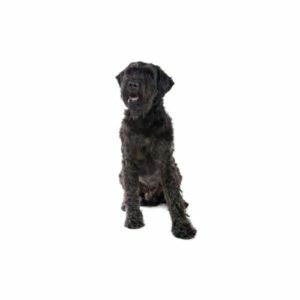 Rugged, agile and even-tempered, the Bouvier des Flandres makes an ideal farm dog. He often tests his working skills in AKC herding tests and trials, and can also be found at agility, tracking, obedience, and conformation events. The breed?۪s double coat protects him from harsh weather and can range in color from fawn to black, passing through salt and pepper, gray and brindle. The Bouvier originated in Belgium and most of the early breeders were farmers, butchers, or cattle merchants not particularly interested in breeding pedigreed dogs. All they wanted was help in their work. The first Bouviers were not absolutely uniform in size, weight, and color, but nevertheless, they all had enough characteristics in common to be recognized as Bouviers. Many had different names ??? Vuilbaard (dirty beard), koehond (cow dog), and toucheur de boeuf or pic (cattle driver).